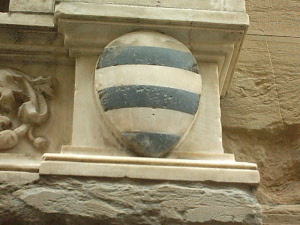 arms of the "Art of Tanners"
In the '300, in Florence, those who were in charge of the leather tanning were members of the "Art of Tanners". The tanning operation that allows the skin to be processed, was done both upstream and downstream of the Ponte Vecchio, where the hides were soaked in the bed of the Arno. Because of the strong fumes, the business was then confined in the vicinity of Piazza Santa Croce, where we can still find "Via delle Conce" and "Street of the Tanners." Today, Florence has kept a flourishing business in leather processing. The artistic binding of the leather goods is carried out using an ancient technique that requires great skill: the object is covered with layers of very thin and lightweight leather, then the craftsman proceeds to the operations of decoration with the application of other material, with inlays or cuts in focus. The industrial processing of the skin has now moved into the province, while the workshops of artistic leather goods shops are mainly concentrated in the center of Florence, especially in the area of Santa Croce, where the same activity was carried out since the fourteenth century.